Look forward for this year’s biggest blast of great Beers, Fantastic Food and Excellent Entertainment which got better. This year’s festival will see German Band Inntaler Musikanten performing five hours of heart stumping Bavarian folk songs & dances and yodeling. Official Oktoberfest beers : Franziskaner, Lowenbrau and Becks will be going that great bargain and offers along with best of Bavarian Cuisine from Euro Deli. What more, It’s all fun at the OktoberFest, with line-ups such as live DJ spinning top charts, game master giving away loads of freebies, street magic, face painting and fortune telling. And of course the return of infamous RM1 BEER. Be there ! 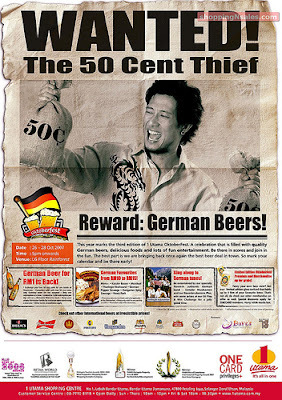 - Exchange your two 50 cents coins for one bottle of beer. - Promotion valid with two 50 cents coins only. So get ready your change. - Keep your bottle for exchange upon purchasing a new one. - Limited Edition Glass Tankard that holds up to 1L up for grabs! - German favourites (Non-halal menu) such as Kassler Bacon, Meatloaf, Thuringer Bratwurst, German Pepper Sausage, Hungarian Spicy Sausage, Roast Pork and many more from RM10 to RM15. ok. be there and I will buy u beer. I just wanna eat. Bacon, Sausage, Roast Pork...ahhhh!!! !